Consider the gift of Comic Bento. I really like the idea of subscription services. They’re everywhere now…it’s like Columbia House, only not so scammy feeling. One that really caught my attention was Comic Bento, the subscription service that sends you comics. I’m into the idea because as a woman, it’s not exactly fun to head into most comic book stores. Plus, Comic Bento is a huge time saver. Tara M. Clapper: How did you get the idea for Comic Bento? Jeff Moss: I’d like to tell you that there was a long conversation around a campfire and we had the help of a wizard and his band of excitable but well-meaning trolls, but the truth of the matter is we simply thought that this would be a good, fun way to get people into comics. The biggest complaint new comic readers have is that they don’t know where to start. So why not take the guess work out of it and send them some books that we think they’ll like and hopefully get them bitten by the comic bug! Conversely, long time readers are always looking for new things to feed their comics addiction, so why not throw a few books at them that they may not have seen? Comic Bento takes care of that and hopefully creates interest in comics from both new and long-term readers. Plus, it’s a fun surprise and who doesn’t like that? TMC: Once you sign up, how much of an input do you have in what gets selected and sent to you? For example, I’m a major fan of Thor – does that mean you’d make an efforts to get me more Thor comics? JM: Well, we encourage people’s suggestions and ideas through our social media outlets, but Comic Bento is a “blind box” style of service. We don’t tell you the exact comics that are in it, but we do pick a theme for each month (for example, Sci-Fi or Mysteries) and all the books in the box will fit into that theme. It’s a closely guarded secret… until we put out our newsletter and tell subscribers what the theme is. Then it’s less of a secret, but the books are still a surprise! The excitement of opening it up and seeing what you get is half the fun, as is reading through titles that you may not have grabbed otherwise. For example in the August box (which had a Science-Fiction theme), there is one book in particular that I think is a really good title, but didn’t get a lot of press when it was released. Exposing people to something they may not have heard of is the best part of the deal…. TMC: Why is Comic Bento a good deal when it comes to the cover prices of comics? JM: …With the exception of this, which is the ABSOLUTE best part of the deal! For $20 (+ shipping, and lower if you sign up for multiple months) we send you $40-$50 (MSRP) of graphic novels. So, not only is it fun, but it’s the cheapest you’ll see a lot of these books, which often cost between $15-$25 each in the stores. TMC: I’m not sure if you’ve ever heard about what it’s like to be a female shopper in a comic book store – but if you go to the wrong one, it’s really not fun. Do you predict a lot of women and girls will prefer to order comic books through your service for this reason? JM: As someone who runs our brick & mortar retail store (The 4th Wall) and has for the last 5 years, it always breaks my heart to hear stories of women being mistreated in comic book stores. It kind of blows my mind that in 2014 stuff like that still happens, to be honest. I’ve worked hard with our male and female staff members to make sure that our store is as friendly and inviting to everyone and anyone as can possibly be. Ordering comics through services like Comic Bento is a great way for people to get into comics without having to worry about stuff like that and I do hope that women like and enjoy our service for a lot of reasons. But, even if they do, the real issue still needs to be addressed and that’s up to fans everywhere, of every stripe and gender to say “I’m not going to put up with that” and either take their business elsewhere, or call out the person in question. I like to think that things are slowly changing, but what I’d really like to see are more female owned/operated stores. It’s not an easy thing to do, but I feel that would be a great step forward towards real change when it comes to these kinds of issues. TMC: Do you send along comics centered around female characters (such as the new Storm series)? JM: Sure! It’s my hope to include in our themes in the coming months both a “Female Lead” and “Female Created” box. With us being a blind box service, I can’t say too much about the creators/titles that I would like to include in such a box, but let me tell you, that those rumours about a Female-Led Spider-Movie sure have a lot of people talking, don’t they? TMC: If a customer wants to keep receiving every issue of a series, is that possible? For example – let’s say you send me “Ragnarok #1” this month and I enjoyed it – could I request the next issue in my next shipment? JM: Comic Bento deals primarily in graphic novels, so that we can give the readers the most complete chunk of story possible. We do have a sister site (www.comicpull.com) that is an online pull-list service for people who are looking to get new issues as they are released. What we want to do with Bento is not necessarily get people into series that may include crossovers or mid-story jumping-in points, but to expose them to some of the titles and creators they may not have stumbled across otherwise in the fullest way possible. We want to give them as much of the story as we can which means we aim for standalone stories/books as well as portions of series that don’t require a huge back-story. From there, I’m hoping that if there is a book they really like, they will find a local comics shop or online retailer and start buying up the rest. As we all know, comics are a gateway drug and we want to hook people into new stuff with every box! TMC: Your site site says you ship indie comics, too. Tell me about how your service helps customers learn about new titles from indie comic book creators. It also helps us as an indie publisher too! Whenever possible we want to include our own works in the boxes to help get a few more sets of eyes on them. It’s hard to get people to try out a new, untested property and it’s even harder to ask them to cough up $15-$20 to do so! With Comic Bento, indie creators are exposed to a large audience and the audience can try them out without having to sink a lot of money into it. 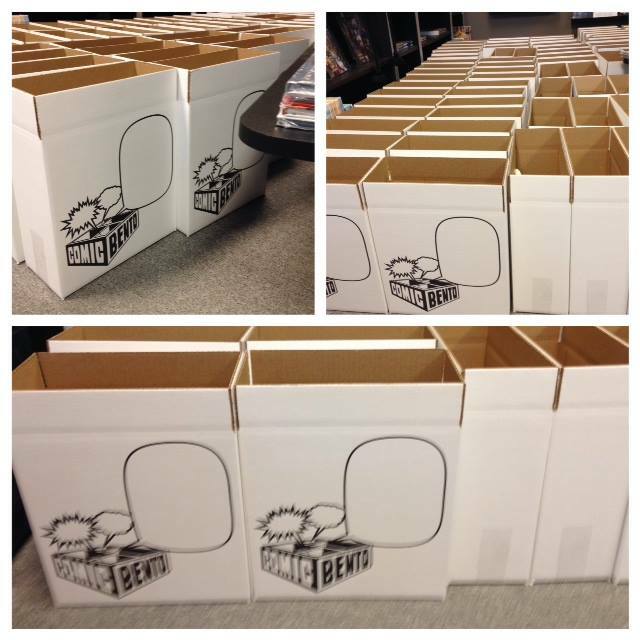 TMC: How can indie comic book creators have their comics included in your shipments? JM: Quite a few publishers and creators have reached out and we are considering any and all comers! (What a weird phrase). All they have to do is drop us a line at [email protected] and link us to the books they’d like to have featured. We love working with indie voices and have been really impressed by some of the submissions so far. It’s exciting to get good stuff that we’re in turn excited to get in front of people’s eyes. TMC: What do you think about the state of comic book shops? Should they become more like centers for gaming communities, or has their time simply passed? JM: As someone who’s been reading comics for almost 30 years, I don’t think the time of the comic book shop has passed, but I do think that comics shops are in danger of being left behind by their own industry. People aren’t interested in comics and gaming as a subculture anymore, it’s actually real, live, pop culture and the stores that understand that and create a welcoming environment, with knowledgable staff and a diverse range of products are the ones that are going to survive. Running a comic shop is not easy, trust me, I know. It should be easy to be honest, but there are things about the industry that actually make it a lot harder than other retail environments. But a good comic shop, like the medium of comics itself, should be something that is ever-evolving and in a constant state of flux, which gives us as readers and patrons of these stores the freedom to make whatever we want of them. With a service like Comic Bento, I would hope that we can get comics into the hands of people who don’t have a comics shop near them and if they do, maybe spark enough interest that they will go down and start up their own graphic novel collection or pull-list. When more people love comics, everyone wins and sharing the love of comics is the main goal in everything we do. JM: Just that I need to add my voice to the chorus of millions saying how good the Guardians of The Galaxy movie is. I kinda want Groot to be my best friend. Interested in signing up for Comic Bento? Get your graphic novels now via their website. Follow Comic Bento on Facebook and Twitter.